The Gilded Age, Visit Newport RI by yacht charter to see the opulance. The Gilded Age in Newport was all that you could imagine and more, on both land and sea, including life in the opulent mansions and life on the luxury sailing yachts that crowded Newport Harbor. 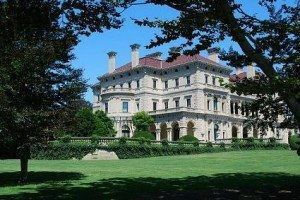 And why not experience the Gilded Age lifestyle when in Newport on your luxury yacht charter? The Dining Room was the center of Gilded Age entertaining, with the opulence of both the Dining room itself and the food served, sometimes 9 courses, designed to impress even the highest sticklers. Step into the center stage of the Gilded age, and experience a private dinner for your group only, in a private mansion, such as the Vanderbilt’s Mansion The Breakers, complete with all of the glitz, glamour and dazzle. And enjoy a specially organized late 1800’s Dinner Menu while visiting Newport; just as those of the Gilded Age visited Newport, on your private luxury yacht. The Dining Room décor was very important in order to create an impressive ambiance for luxury dining. At The Breakers, built by Cornelius Vanderbilt II, the Dining Room alone was 2,400 square feet, with a massive 16th century style table meant to seat up to 34 guests in carved oak seats that were so heavy a footman was required to seat the ladies. Around the edges of the room, were 12 freestanding alabaster columns with Corinthian capitals supporting a huge carved and gilt cornice. Decorated in a Roman motif with an 18th century touch, the ceiling was magnificent with the Goddess Aurora painted in a mural that depicted bringing in the dawn in a chariot drawn by 4 horses. The room was lit by baccarat crystal chandeliers and 11, 22, and 24 carat gold gilt was applied to the walls with rabbit skin glue. Today, the room has been restored by The Preservation Society of Newport County to its previous glory, and Northrop and Johnson Yacht Charters can organize the Dining Room to be rented at night for you to experience your own private Gilded Age dinner when visiting Newport on a luxury yacht charter. From “Mrs. Beeton’s Book of Household Management”, is the following suggested Victorian Gilded Age menu designed to impress with each course offered by liveried footmen. Each course accompanied, naturally, by the correct wines or champagnes. 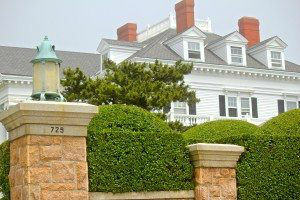 What could more special than experiencing a slice of life from the Gilded Age, only available in Newport, Rhode Island where luxury yachting combines with luxury living; and where you can enjoy your own private Gilded Age dinner in one of Newport’s Gilded Age Mansions, organized by Northrop and Johnson Yacht Charters.